Canvas can help mitigate bias in grading student work with two features: anonymous grading and moderated grading. There are many benefits to setting up “blind” or anonymous grading. By anonymizing student submissions, graders won’t be able to identify specific students, which in turn limits unconscious presumptions. This will also help graders work objectively on the current submission instead of relying on a student’s past performance. Moderated grading, on the other hand, allows multiple reviewers to grade a single student’s work. Each grader will have an opportunity to submit suggested grades for the assignment, and then the moderator (or instructor) can review and assign a final grade. For example, if you have three teaching assistants who help grade student submissions, you can ask all three TAs in your course to grade all submissions. Then you can review their assessments before determining the final grade. This feature can help ensure that grading is consistent. Also, if a TA tends to grade too easily or harshly, moderated grading will allow you to intervene and advise the TA on proper grading strategies. The multiple grade assessments can also be presented as evidence if students have complaints about the grades they earned. Canvas’ anonymous grading and moderated grading features have many settings which can be used in different combinations. When faculty use the anonymous grading feature in a course assignment, they can create assignments with the option to hide student names from graders. This feature can be edited and changed by the faculty member or a Canvas admin. 3. In Course Navigation, click the Assignments link. 4a. If you want to edit an existing assignment that has not yet received student submissions, click the name of the assignment and then click the Edit button. 5. Next to the “Anonymous Grading” header, click the Graders cannot view student names checkbox. 6. Remember to click the Save button! 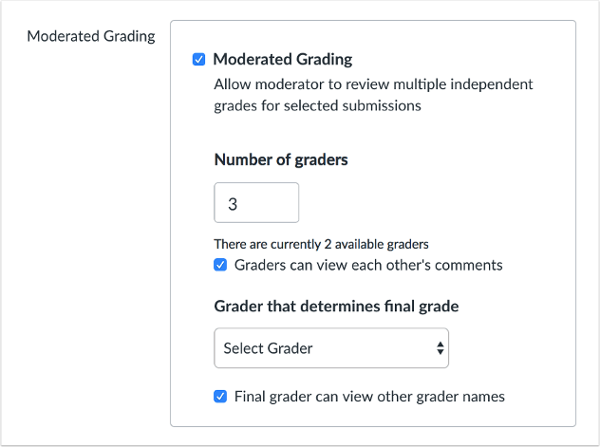 When faculty use the moderated grading feature in a course assignment, they can create assignments which will be reviewed by multiple graders, review the grades themselves, and then select which grade should be set as the final grade for each student. For each moderated submission, the faculty member will often want to be set as the moderator. Only the moderator can specify the final grade for each assignment, but the moderator does not have to personally grade the assignment. Once the assignment is created, only the moderator and Canvas admins will be able to change the assigned final grader. A moderator does not have to specify which graders can grade submissions. If a course includes a surplus of graders higher than the desired number of graders, any grader can assess an assignment submission until the specified number of graders has been achieved. When an assignment has reached the specified number of graders, remaining graders will not be able to access the assignment. The moderator is never included in the number of available graders, since the moderator does not traditionally grade individual submissions but may provide a custom grade. Also, please note that moderated assignments cannot be edited by any grader except the moderator. The moderator can use the grade summary page to view all grades awarded by one grader and compare them to grades awarded by another grader. Grades are grouped by grader name. In the Dashboard, all graders receive a To-Do notification when submissions have been received from students and are ready to be graded, regardless of assignment type. The moderator, meanwhile, receives a To-Do notification in the Dashboard when at least one submission has been graded for a moderated assignment. assignment and then click the Edit button. 5. Next to the “Moderated Grading” header, click the Moderated Grading checkbox. 6. In the Number of Graders text box, enter the number of graders who should grade the submission. 7. If you want to allow graders to view each other’s comments, select the Graders can view each other’s comments This option is selected by default. 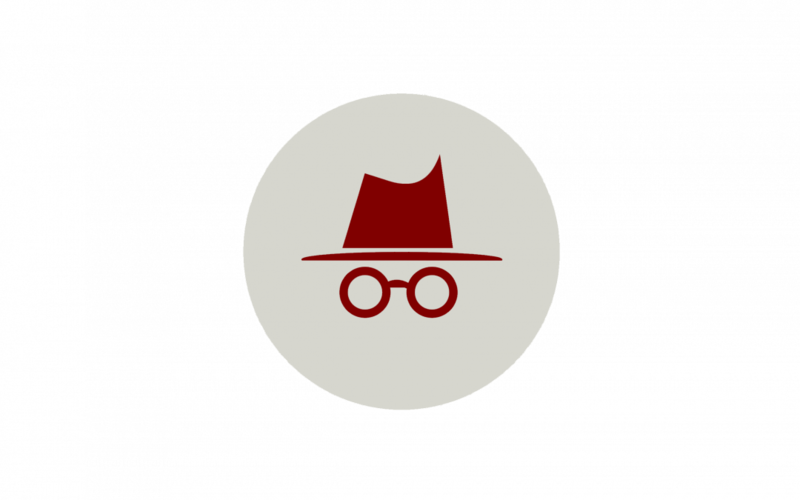 Remember: If anonymous grading is also enabled for your course, selecting this option displays the Graders cannot view each other’s names checkbox in the anonymous grading assignment options. This extra option allows graders to view comments from other graders but not view the name associated with each comment. 8. In the Select Grader menu, select the name of the moderator, i.e. the grader who determines the final grade. This will often be a faculty member or instructor. 8a. If you want the final grader to view the names of the graders who graded each submission, select the Final grader can view other grader names checkbox. This option is selected by default. 9. Remember to click the Save button! Grades are not displayed in the Gradebook until the assignment is manually unmuted. Additionally, to remove anonymity from each submission, the assignment must be edited and changed so that graders can view student names. If you need advice and assistance with anonymous and moderated grading, or if you have other questions, Academic Technology Solutions is happy to help. You can attend one of our walk-in sessions held in the TechBar of the Regenstein Library (see our workshop schedule for upcoming sessions), or contact us to schedule a consultation.